From left, Brian Veneklasen, Jane Michmerhuizen, Mary Dornbos, Howard Veneklasen, Bill Veneklasen, Elaine Van Zzlis, Barb Blaukamp, and Wayne Veneklasen, all descendents of the Veneklasen Brick Co. founders, recently com-memorated the company with a historical marker, located near the bridge at 104th Avenue and Paw Paw Drive. Two new historical markers celebrating bricks and chicks were recently dedicated in the city of Zeeland. 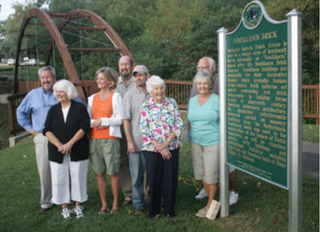 A ceremony was held earlier this month to celebrate the new state historical markers, dubbed the “brick and chick duo” by the Zeeland Historical Society. The markers celebrate the city’s history of poultry and Veneklasen bricks. Historical society manager Kit Karsten worked to bring the historic markers to the city. One marker honors the Veneklasen Brick Co. and sits on the former site of the brickyard near the bridge at 104th Avenue and Paw Paw Drive. The Veneklasen Brick Co. was founded in 1848 and later became known as the Zeeland Brick Company with brickyards throughout the state. The second marker commemorates the poultry industry and is displayed at VandeLuyster Square at Church Street and Central Avenue. The area had more than 60 hatche-ries, reaching its peak in the 1930s and ’40s with about 13 million chicks produced each year. The markers cost about $3,500 each and were funded mostly through donations.